SALEM — Certainly you cannot get any more real than sleeping outdoors … in a snowbank … in sub-zero weather … with the wind ripping off Mt. Abraham and whipping ’round the corners of Mt. Abram Regional High School in Salem. That’s exactly what 13 student members of the Mt. 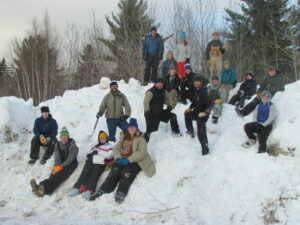 Abram Outdoor Club and their five adult chaperones did on Saturday into Sunday, Feb. 16 and 17. This third annual winter overnight was the pièce de résistance of their winter break. Last year’s event was held on Beal Pond in Madrid, but, all agreed, holding it on the school grounds made it accessible to more participants. Of the 30-something members of the club, these 13 brave youth – and five dedicated adults – spent Saturday building snow shelters of various types behind their school. 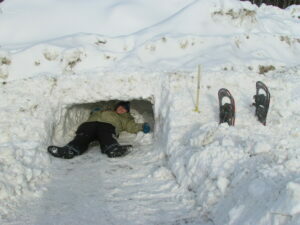 Some dug caves in the snowbanks, making a shelter known as a quinzee. Others dug snow trenches or snow pits. Floors of each were lined with evergreen boughs. Pits and trenches were covered with tarpaulins weighted down with snow and/or branches, then covered with several inches of snow for insulation. At least one of the chaperones used an all-season tent. Because so many of the Outdoor Club members are involved in extracurricular activities, logistics for meeting to plan adventures are tricky. Executive meetings are held periodically during lunch or “seminar.” With their advisors, science teacher Jim Danala and PE/health teacher Lanie Roy, this group debriefs past adventures and makes plans for the next. They talk about expectations and what they want to happen. “But a lot of the learning happens right on the ground (of the adventure),” Danala explained, because it is so difficult to get the whole group together at any given time. The Executive Committee is a combination of “the old guard and the new,” the initiates having been elected by last year’s leaders. Current committee members present at last Monday’s meeting are seniors Alice Cockerham, Dylan Starbird, Dillan Wells and David Kidd; and Cam Wahl, Cade Tooker, Chandler Rollins, and Konor Dyar. They talked about Winter Overnight 2019, told tales of other outings, and shared what it is about The Outdoor Club that attracted them to it. One of the greatest draws, aside from members’ common interest in being in the great outdoors of western Maine, is the chance to get to know their schoolmates better, see a different side of each other than what’s displayed in the classroom. Alice says it’s that common liking of the outdoors that brings so many different personalities together. Cam enjoys all the different opportunities they’ve been able to experience through membership. She pointed out that many of the unique activities have resulted from various grants which have given participants these chances to try new things that might have been out of reach for them as individuals. 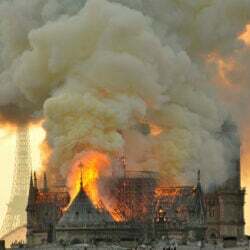 Alice added, “Then, 15 minutes later, he fell and broke a pole” – and worried the rest of the trip about not being able to go to Costa Rica with his Spanish class because he was going to have to pay for the broken equipment. By the time they ran out of stories, they’d brought it all back to the winter overnight – the freezing cold, the need to bring more blankets next time, and “that cobbler thing in the Dutch oven,” a reference to the peach cobbler made by FSAR (Franklin Search and Rescue) member John Rollhauser. “The Huts” the group is so excited about are four eco-lodges widespread amongst the 80 miles of trails in the Kingfield/Carrabassett Valley Region. 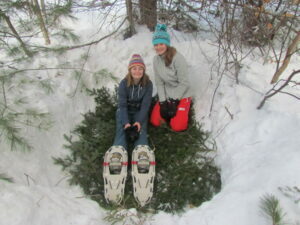 This whole system is operated and maintained by Maine Huts & Trails, a nonprofit organization based in Kingfield. One of the goals of the Outdoor Club is to visit at least one of the four huts – Stratton Brook, Flagstaff Hut, Grand Falls Hut or Poplar Hut – a year. “It was so windy, we couldn’t make it to the other end (of the lake),” Danala said. That trip turned out to be way more of an adventure than expected and has become one of the prime examples Danala uses to stress the necessity of being thoroughly prepared and ready for anything. He and the other leaders of the club work hard to instill in the youth the idea that when you are in the woods, you have to go with Mother Nature. “Have a plan, but be ready to adapt,” he instructs them. “We’re aiming for two huts trips this year,” Dylan added. They camped at the Grand Falls Hut back in November. Members of FSAR were also on site. As supporters of the Outdoor Club for the past three years, they lead “workshops” on various topics, including shelter-making, outdoor survival and emergency first aid – all prequels to the Winter Overnight. Once, at the Stratton Brook Hut, FSAR staged a snowmobile accident and the youth had to assess the situation and perform rescue procedures. It’s experiences like this, whether staged or real, on-the-spot problem-solving such as in the case of drastic weather changes on Flagstaff Lake, Jim Danala stated, that the youth take with them into life after high school. Jim spoke of one fellow who recently finished trekking the Appalachian Trail. Because of training he’d had in a similar program, the young man was eager to share with Danala how he knew what to do when nasty weather high in the mountains forced him to hole up safely and wait it out. “You never know where life will take you,” Danala remarked, noting that by taking part when new opportunities present themselves, you may be preparing yourself for some future challenge. The Outdoor Club was started at Mt. Abram High School in the 2015-16 school year thanks to a student and his Senior Project. 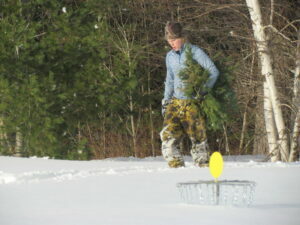 Seth Thomas, from the Kingfield area, wanted to start an Outdoor Club. He took his idea to the school board and obtained their approval. He reached out to Teens to Trails, another organization dedicated to getting teens into the outdoors, and got some funding, “including some great discounts through L.L.Bean.” The Outdoor Club was born and has been flourishing ever since. Though still supported as much as possible through such resources, Danala explained that “a lot of these grants are coming to an end.” Thus the need for members to contribute some money from their own pockets. Each adventurer contributed $12 for the Winter Overnight to help defray the cost of absolute essentials, such as Cosmic Brownies and at least six pounds of bacon. “We’ve found that Cosmic Brownies are a must-have, but they are heavy to pack in,” Danala admitted. Additionally, transportation is one of the greatest expenses, another reason for winter camping right behind the high school. Parents help whenever possible to keep costs low. Sometimes, if parents are unavailable, participation is negatively impacted. “That’s a lot to ask,” Danala noted. “We are always looking for new funding options,” he said. Miss Lanie got involved in the club three years ago when she was teaching PE at Kingfield Elementary School. That year, the eighth-graders in the district were invited to a Huts adventure. Sort of an orientation event for incoming freshmen. Since then, biology teacher Jacob Boone, social studies teacher Tom Fiske, and special ed teacher Jed Nickerson have also joined the adult leadership team. Danala’s wife, Leah, sometimes helps out, as well. She went on the Moose River adventure last summer, along with Danala, Miss Lanie, and Marc Keller, former PE/health teacher at Mt. Abram and Outdoor Club advisor, now athletic director at Spruce Mountain, Jay/Livermore. Speaking of Marc Keller, Miss Lanie remembers when she was a student at Mt. Abram back in 2001-2003. Marc Keller and Barry London, former social studies teacher, now principal at Stratton Elementary, had an outdoor management class. Students in this program camped, rafted, canoed, learned first aid and safety and, among many other skills, how to build campfires and shelters. Being outdoors in the geographical area where Mt. Abram students live, work and play is really not just a random adventure for many – it’s a tradition, a way of life. Real life. Through the initiative and enthusiasm of the members, leaders, and supporters of the Outdoor Club, others who may be less familiar with “nature” in its many forms, both gentle and fierce, are finding out for themselves how real life can be when you live it outdoors in the western mountains of Maine.